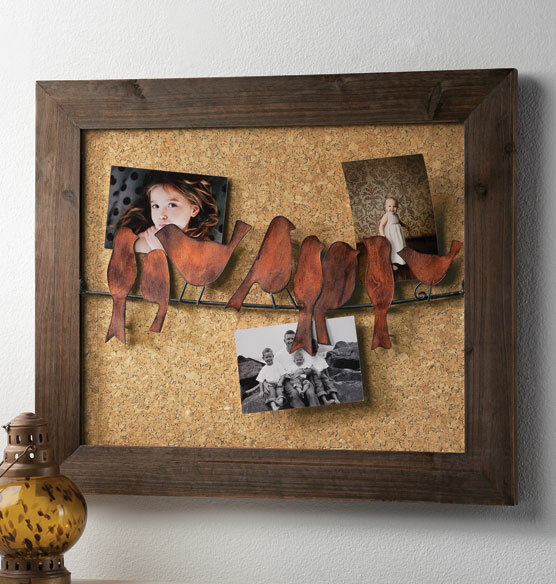 It’s easy to fall in love with the rustic appeal of this charming Birds on a Wire pin board. The cork board framed in wood serves as a handy backdrop for a flock of birds. The birds harbor a pragmatic secret, too—each one has a clip on its back to hold messages, photos and other small papers. Tell your story by arranging favorite photos and mementos on the pin board, or use it as a message center for keeping your family communications organized. Available only from Exposures, this cork pin board is the perfect way to add a bucolic accent to your décor. It's unique, beautiful, and functional.